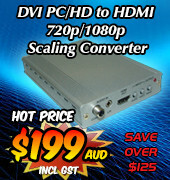 The SCART to HDMI v1.3 Scaler Box displays your SCART analog video/RGB image to any HDMI capable HDTV. 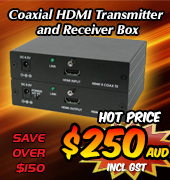 Now you can use modern HDTV's with your older style SCART output devices. Utilizing simple plug'n'play functionality, the scaler box will upscale the analog signal to full HD v1.3 1080p digital video. 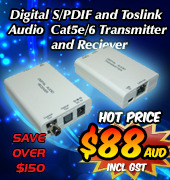 The audio component of the analog signal is also transferred to digital audio and output with the HDMI signal. 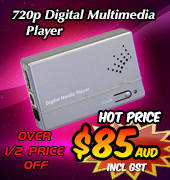 RGB to Video Format Converter converts 15K RGB combined sync to NTSC or Pal (user selected). The input is through the standard 15 pin d-sub connect and the output is through either Composite or S-video.